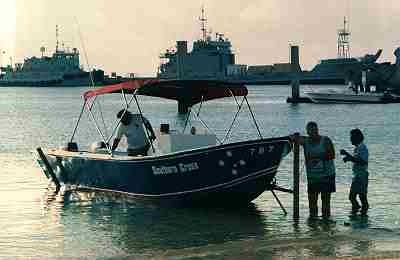 Here's a picture of V-Dory I built here at Kwajalein Atoll, Marshall Islands. I added an extra frame and made it 25 feet long. It is powered with twin 70 hp outboards and is a great fishing boat. I made a center console and added a large bimini top. I use it for bottom fishing for red snapper and grouper and also troll in the Pacific for Yellowfin tuna and wahoo. I love it and get lots of favorable comments about it. It has more fishing room then most of the store bought boats here and is much faster than the 22 ft Boston Whalers equipped with the same motors. I have two 50 gallon fuel tanks and have enough range to visit some of the outer islands here. Thanks for helping me have such a nice boat! My next project will be a double kayak and I hope to start on it in 1999.